Xee provides a connected OBD device that you can easily plug into your car. 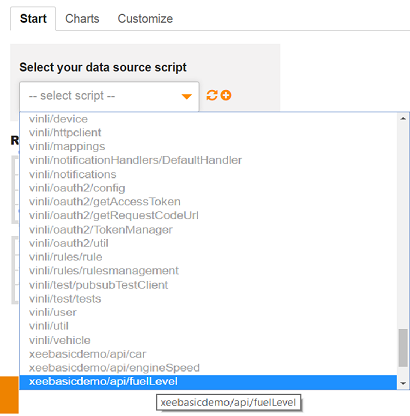 They also expose the device’s features as REST APIs through their open platform, which we wrapped with a connector that you can use from within your scriptr.io scripts, making the implementation of applications for connected cars even easier. Let’s demonstrate this with a simple demo application, described in the following paragraphs. Our simple demo application consists in exposing the status of some of our connected car’s components into a dashboard. To keep it simple, we’ll only display the fuel level, speed and engine speed, and will use sciptr.io’s powerful Google chart scripts to build the below dashboard. Using the Xee connector is rather simple. Once you have imported it to your account, create an OAuth token for your end users (you can use your own Xee account as an end user account), by executing the getRequestCodeUrl and getAccessToken scripts respectively (obtaining tokens is described in details in the README.md file of the connector). We proceed similarly and create two other APIs (scripts – speed and engineSpeed) to respectively return the car’s speed and engine’s speed. Let’s now see how to display the values of the fuel level, speed and engine speed on gauges using Google chart scripts. 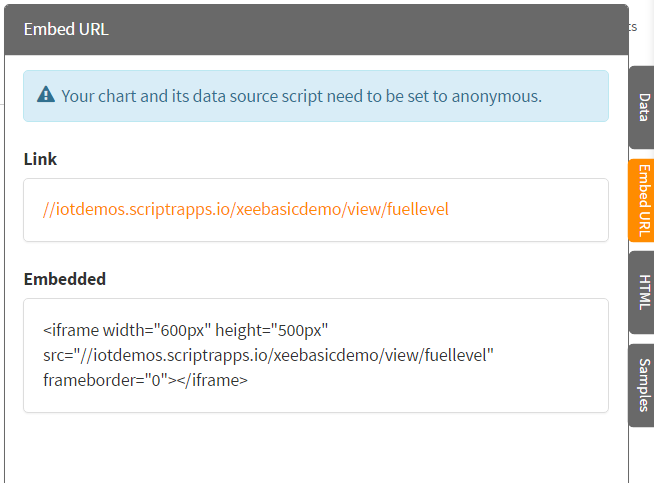 In your scriptr.io workspace let’s create a script to display the fuel level: click on “+ New Script” > “Google Chart”. In the editor that is displayed, click on the “Start” tab, then scroll to the “fuelLevel” script. Select “fuelLevel” then click on the “Charts” tab. 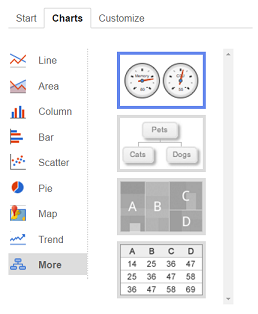 Scroll to the bottom of the list of possible charts and click on “more”, then select the gauges. You can customize the gauge my specifying min/max values and different brackets by clicking on the “Customize” tab. 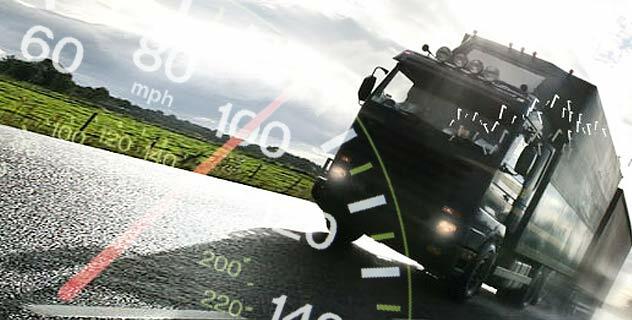 Proceed in a similar way to create the gauges for the car’s speed and engine speed respectively.